Last year I read Ursula Poznanski’s YA thriller Erebos and liked it a great deal. When Lizzy mentioned that one of Poznanski’s crime novels for adults had been translated, I knew I had to read it. Not that I read it in English, of course not, but it’s always nicer to review books that have been translated. Five – Fünf, the first in a series, introduces detectives Bea Kaspary and Florin Weininger of the Landeskriminalamt in Salzburg, Austria. They have been called to an unusual crime scene – a cow pasture. A woman has been found dead. Her hands tied in the back. She has been thrown from a small mountain overlooking the pasture. On the soles of her feet, they find a tatoo of strange numbers, which turn out to be coordinates. Those will lead them to a severed hand and more co-ordinates, which lead to another body part and other coordinates. The second set of coordinates aren’t added in the same straightforward manner as the first. They can only be found after the detectives solve a riddle for which they need to find someone. As if finding body parts wasn’t bad enough, the people who are the clues to solve the riddles, get killed as soon as they have been found by the police. 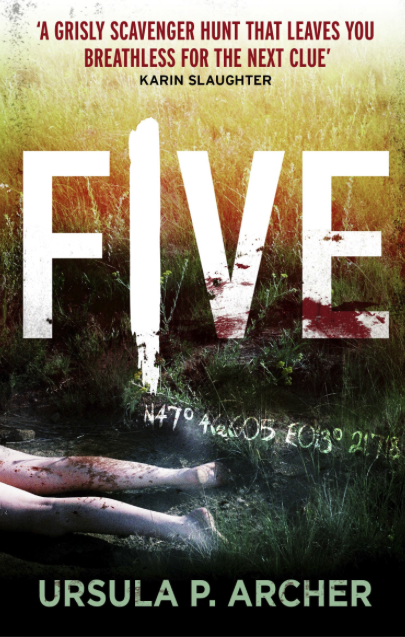 Five is very well done. It’s extremely suspenseful and, like in her YA novels, Ursula Poznanski/Archer uses a type of game or hobby – in this instance geocaching. I’d never heard of it but it seems that the author herself is a dedicated geocacher. Geocaching uses coordinates and hiding places. On a website you find coordinates and can then hunt a hidden object. The objects are often hidden in beautiful places. So it’s a bit of a mix between hiking and some sort of treasure hunt. It’s a trademark of Poznanski’s writing to use such modern-day games/technology as a base—computer games, live role-playing, drones . . . I can’t say too much but although this sounds like a serial killer story, it’s not. Nonetheless, it’s quite gruesome in places. Since this is the beginning of a series, the characters are very important. The detectives are very likable and well drawn. Bea is a mom of two, newly divorced from a bullying husband and still deeply traumatized by something that happened in her past. Florin is single but just started to date someone. That’s important because Bea clearly has a bit of crush on him. They work very well together, are almost friends. Bea is rather unconventional and gets into trouble with her superiors while Florin looks out for her and defends her. One could call Five a crime novel with thriller elements. It’s very suspenseful and should appeal to many different crime readers – those who prefer thrillers, those who like a mystery, and those who love police procedurals. 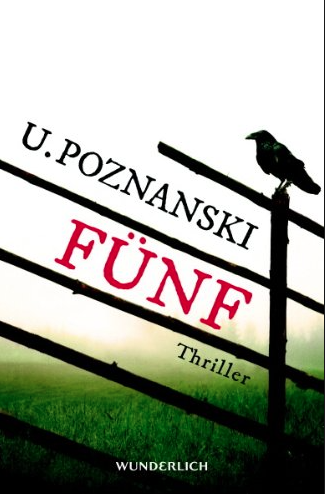 It has Poznanksi’s trademark mix of likable characters, impeccable pacing and contemporary feel. None of her novels could have been set at another time. I like that. She explores many themes in this book but they are tied so closely into the motive for the murder that I cannot say too much. If you’re looking for a suspenseful page-turner and love crime series, give this one a try. If you’d like to find out more about geocaching – here’s a link. The cover for the translated version of the novel is so brutal when compared to the original cover that they could be different books. I wonder sometimes how cover images are chosen and whether they are aimed at specific audiences, etc. Thanks for bringing this author to my attention…I’m going to see if my local library can get me a copy of this one. My pleasure. I hope you’ll like it. You’re right about the covers. The English cover looks like dozens of covers I’ve seen before. And isn’t doing it justice. That said, it has some gruesome elements. All of her German books gave rather good covers. At first I thought I’d go for this, but I’ll pass due to the word ‘gruesome.’ Thanks for the warning. I know. It’s a longish book, so the gruesome parts are minor – length wise but they are there. Glad it was a hit, Caroline. I hope to get my review up on Thursday. I have noticed there is a lot of ‘geocaching’ here. That is what they call it in Tassie. This book sounds like something I might enjoy for a change so I just put a hold on it through the library web page. I have a slight weight as someone else has it now but I am next in line. Thanks for the review. Oh boy! I have no clue why I made those typos. Of course it’s geocaching. I got it right in the last one. I hope you’ll like the book. let me know. I’d be so interested to hear your thoughts. Have not heard of this author, but I’m becoming a big fan of the genre. Thanks for the heads-up, Caroline. My pleasure. If you’re looking for a tight, gripping story, you’d like it.